We stayed at her sister and brother-in-law’s after the memorial, and woke to hugs from her nephews–a pair of 5-year-old twins and their year-older brother–adorable little dudes all. We helped organize pancakes for everybody’s breakfast, as well as some very important wardrobe choices. All the Kindergarteners were dressing up: it was Fancy Day. (Pajama Day had long since passed, and while every day is Crazy Hair Day in my world, I’m glad I didn’t have to demonstrate it more than usual when I was in school.) Ties were knotted, Church shoes were put in backpacks–it’s too snowy on upstate New York sidewalks for anything other than boots until you get to school–and photos were taken to send to grandparents. I collected my repaired machine on the way to work, and stopped to collect dinner on my way home. 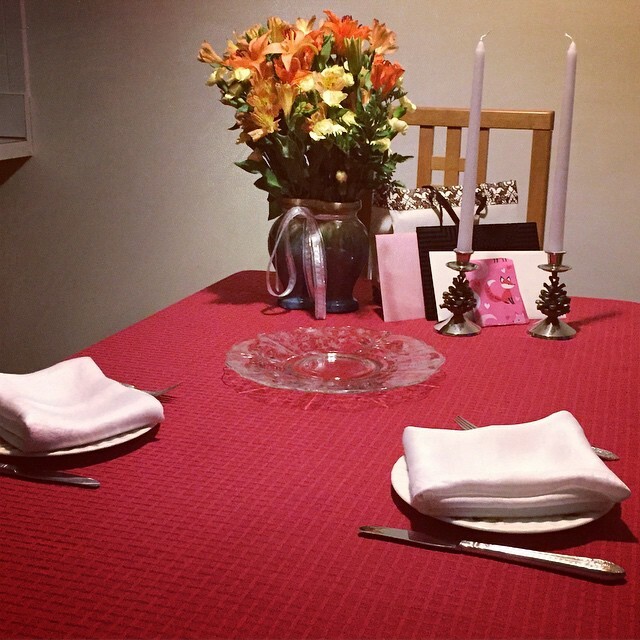 While I was out, she swept up the remaining dust from the installation of our new backsplash and set a gorgeous table. On which we had burgers and fries. But they were the really good burgers, and accompanied by the really good slaw. We sipped Vitamin Water from champagne flutes. We exchanged heartfelt cards and very small gifts. We looked terrific. (We even took a photo to send to her parents.) But mostly, we were together. And that’s fancy enough for me.